Here in New England, fall is definitely in the air! It’s been a week of 75 degree highs and 55 degree lows and I have to say, I’m pumped! Don’t get me wrong, I love summer. Oh right! AND the autumn harvest! This week, I made Heather’s favorite homemade veggie burger for a birthday dinner with her folks. It’s a pretty basic ingredient list of leafy greens, cannellini beans, sweet potato, and fresh bread crumbs, but when you put all of that together with some sweet and savory seasonings, it becomes birthday-dinner worthy! Now, when I tell some people that we make our own veggie burgers, their eyes goes wide with disbelief. We had a party back in May where we served four different kinds of homemade burgers and our guests just couldn’t get over it! Seriously, friends. I promise. It’s not that difficult. Once you start making your own, you’ll never reach for that box in the freezer section again. However, I do confess that this particular recipe has more steps than most. So perhaps this isn’t the best recommendation for someone who is seeking a quick and easy go-to alternative to the frozen box. I promise to post other, simpler veggie burger recipes in the future. Look at those colors! Photo courtesy of Tracy Krulik. If greens are not already cooked, boil a pot of salted water and then place the greens in for about 20 seconds. Remove from the water and place in a bowl filled with cold water and ice cubes. Let cool and then squeeze as much water out as possible. Place beans in a large bowl and mash them roughly with a fork. Be careful not to go overboard – it should be somewhat chunky for texture and binding purposes. Stir in greens with a fork. If you are making your own fresh bread crumbs, take a piece of fresh bread, tear it into pieces, and place it in the food processor. Process until coarsely chopped. It should be fluffier and less fine than the kind you buy in the store. Put 2 tablespoons of oil or butter in a large skillet on medium heat. Add the sweet potato and season with S+P. Cook, stirring frequently, until it begins to soften and color, about 5 minutes. Stir in the bread crumbs and remaining spices and cook for another minute or so. Inhale deeply. The smell is divine. Stir the sweet potato mixture into the bean mixture with a fork, mixing until blended. Let the mixture rest for a few minutes. Taste and adjust seasonings. Shape it into 4 – 6 patties (we usually wind up with 6) and heat up the skillet with the rest of the evoo or butter. Carefully slide the burgers into the pan (they can be delicate and might fall apart a bit – it’s okay) and cook until nicely browned (about 5 minutes on each side). There is no egg in these burgers, so you need not worry about making sure that they are “done” – just that they are warmed all the way through. I like them with a bit of crispness on the outside. The last time I made these I decided to add some freshly grated ginger with the sweet potatoes, because we had it on hand and I thought the ginger’s sharpness would complement the sweetness of the cinnamon, nutmeg, and sweet potato. It was nice, but not well distributed. I wound up with a few bites where I could really taste it and others where I couldn’t at all. Work in progress. You can top these with just about anything, but I usually opt for some cheddar cheese and dijon mustard. Heather likes BBQ sauce on them. We’ve served them on whole wheat rolls, English muffins, toasted bread, whatever you’ve got will do. I forgot to take photos of the burgers, but I’ll leave you with this photo of something else that graced the table that night! 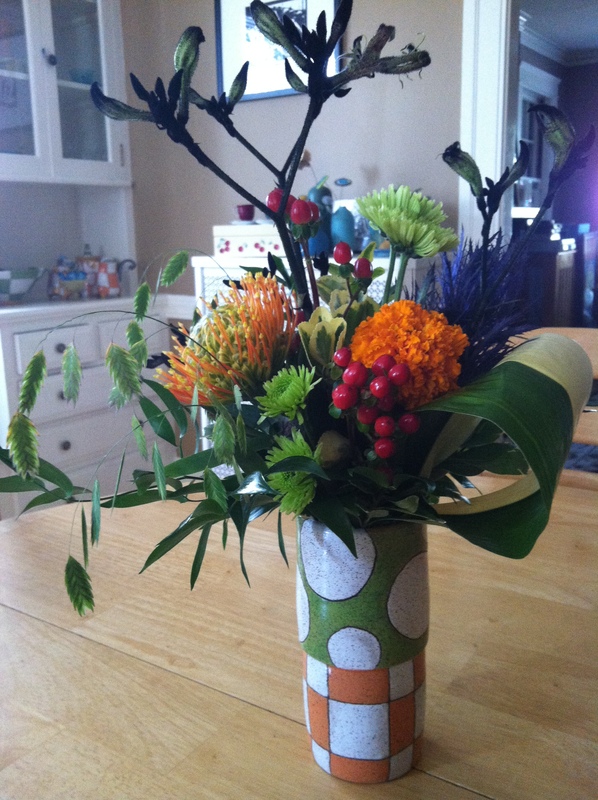 Vase made by Providence artist Loren Chen; flowers meticulously arranged by Sprout (Worcester).